How to find the hunting property that’s right for you and your hunting goals. Do you know where the Potlatch name came from? Find out in our “Into the Forest” feature interview! Meet Davis DuBose Knight Forestry and Real Estate – one of our Preferred Brokers from Little Rock, Arkansas. Don’t miss the Property Showcase to see some of our best land-buying opportunities. All this and more… don’t miss a single tidbit! You’ll find all these great articles in this issue of The Property Perspective – ONLINE or PDF (to read, just click on your preferred viewing format). Alabama | Arkansas | Idaho | Minnesota | Mississippi. Click here to tell us a little more and we’d be happy to introduce you to a member of our team – each an expert in their neck of the woods and the perfect partner in your search for your dream property. 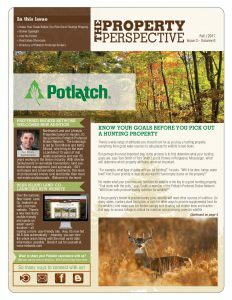 This entry was posted in Hunting, Land Buying Tips, Lifestyle, PotlatchDeltic and tagged Fall, Land buying tips, Newsletter, Potlatch Land Sales, Property Showcase. Bookmark the permalink.